Workman Publishing Company, 9780761137917, 400pp. Look up Religion, and discover this from Paris Hilton: [The Kaballah] helps you confront your fears. Like, if a girl borrowed my clothes and never gave them back and I saw her wearing them months later, I would confront her. Or Anatomy, and find sportscaster Jerry Coleman: Winfield goes back to the wall. He hits his head on the wall and it rolls off! It’s rolling all the way back to second base! Or Truth in Government—here’s Senator Alan Simpson: There are a lot of things that we do that are irrelevant, but that’s what the Senate is for. Arranged alphabetically, from Accident, Traffic to Zoology, Game Show Contestants’ Knowledge of (and you wouldn’t believe how distorted that knowledge sometimes is), The Lexicon of Stupidity is an overstuffed dictionary of quotes, banalities, actual book titles, holdup notes, menu items, TV listings, and more, each meeting one exacting criterion: they’re so jaw-droppingly dumb you can’t help but laugh. It’s the wit of the witless. The comedy of the clueless. The giggly fun of celebrities, athletes, politicians, newscasters, and other pompous types planting a foot (or two) firmly in mouth. 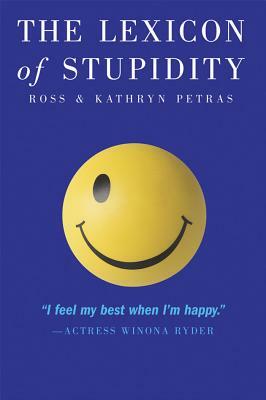 And no authors could be more qualified to pull it together than Ross and Kathryn Petras, whose calendar celebrating stupidity—The 365 Stupidest Things Ever Said—is a perennial knock-out, with millions of copies sold since its debut in 1995.